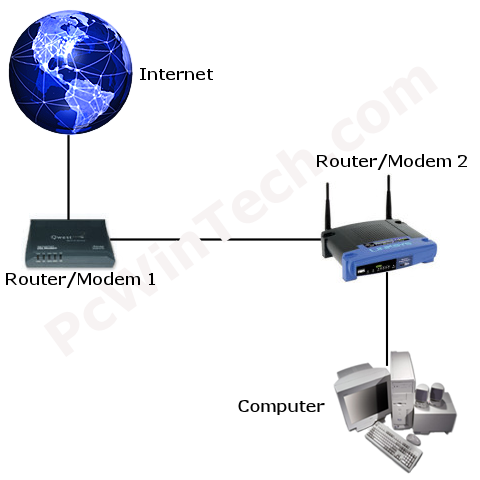 One of the most common issues people encounter is when they have more than one router hooked up. Sometimes people don't realize their modem is also a router (Such as DSL) and other times people hook up an extra router to use things their router/modem doesn't have, such as wireless. First off DMZ is supported by nearly every router/modem out there. What DMZ does is allow you to tell the router to forward all incoming connections to a single IP address. So in this case we will setup DMZ in the first router to point to the second router. Now all incoming connections are sent to the 2nd router and thus your port forwarding & triggering will work again. So here is a quick example. I log into router 1 and go to the DMZ settings and put the WAN IP address of the 2nd router there. Now router 1 is out of the way for port forwarding and triggering as all incoming connections are now being forwarded to router 2. Now in router 2 I can setup my port forwarding & triggering rules just like normal. So here is a quick step by step. Step 3. Log into the first router/modem now. Step 5. Enter the IP you wrote down into the DMZ page and enable DMZ. Step 6. Save and your done. Quick Tip: You should setup a static WAN IP address for router 2. If you leave it on DHCP the IP could change thus breaking the DMZ and of course breaking the port forwarding & triggering. This doesn't happen very often, but it is always a possibility.